← What’s Up at the Museum? 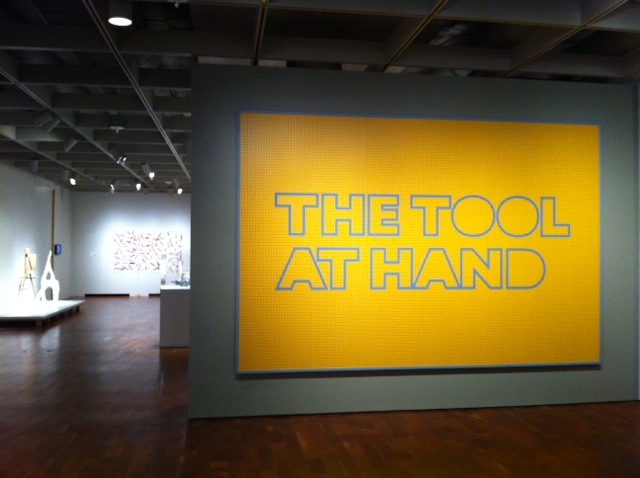 Have you had the opportunity to stop by The Tool at Hand yet? 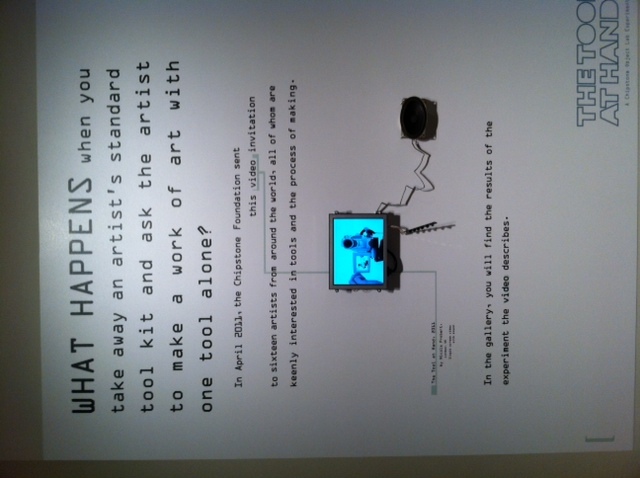 Last month, I wrote about an awesome performance that took place at Sweet Water Organics in preparation of the Chipstone Foundation’s Tool at Hand exhibition at the Milwaukee Art Museum. The Tool at Hand’s premise is simple: create a work of art using only one tool. Last spring, Ethan Lasser, the exhibition’s curator, sent out a video invitation to 18 artists located in Europe and the United States. Of these 18, 16 agreed to participate in the exhibition. The video, created by Nicola Probert, was itself made with just one tool. In it, one can see a video camera being taken apart as Nicola describes the challenge. The artists are not told what material to use, what tool to use, or how to use it. They can interpret the exercise as they see fit, as long as they keep in mind certain questions. Why did you choose this tool? Are you using it for the task for which it was intended? 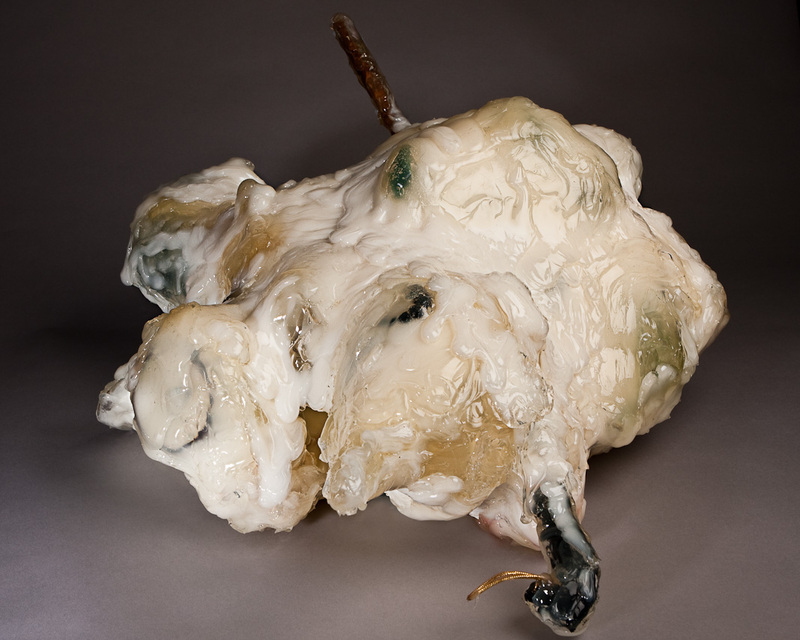 The aim of the exhibition is to explore artists’ attachment to their tools, as well as set up an experiment to find out what happens when artists are faced with an interesting constraint. Creating a work of art with one tool seems easy enough, right? But a number of questions quickly arise when you consider this challenge. How many things do you think are made with only one tool? Do you know what tools were used to make the objects you use on a regular basis? For example, how was the shirt you’re wearing made? How about the computer you type on? How do you define a tool? Is your hand a tool? If you use your computer to create something, is the computer the tool or is it the software? The artists included in the exhibition usually use many tools to create their works of art. They took this video invitation as a challenge to either create a work similar to what they usually create, but with limited resources–or as an opportunity to create something completely different from their usual art practice. David Gates resolved to try and create one of his functional sculptures by using one tool, instead of his usual 80. To accomplish this, he bought a construction saw and manipulated the blunt edge to create different sharp edges. In other words, he created his own tool. On the other hand, Beth Lipman, a well-known glass artist based in Sheboygan, WI, decided to use caulk as her medium and a caulk gun as her tool (above). The artists also interpreted the definition of a tool in a variety of ways. Joy Garnett, a New York City based painter, painted a canvas using one brush. 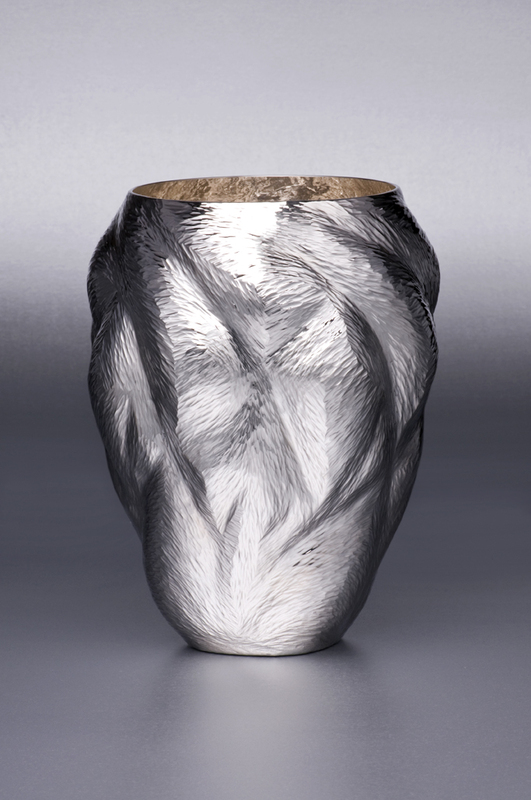 Ndidi Enkubia, on the other hand, crafted a beautiful silver vase using a family of hammers (above). Milwaukee is a city full of creative people. Walking through the exhibition and viewing the artist videos, have you wondered what would you make if you were asked to participate in the same challenge presented to these artists? What tool would you choose? What medium? Why? Well, the opportunity to show us is here! The Chipstone Foundation has decided to extend the Tool at Hand challenge to all of Milwaukee. Watch Nicola Probert’s video to listen to the call for art, and create! You do not need to submit a film, nor send the work to the Milwaukee Art Museum. The works will be shown at Sweet Water Organics on Saturday, March 17. They will be judged by the artists from The Tool at Hand, and the winning maker will receive a prize. If you are interested in participating, please email me by Friday, February 24. We will sign you up and send you more details about the event. I look forward to seeing what Milwaukee’s innovative makers create! This entry was posted in Art, Curatorial, Exhibitions and tagged Chipstone Foundation, The Tool at Hand. Bookmark the permalink.